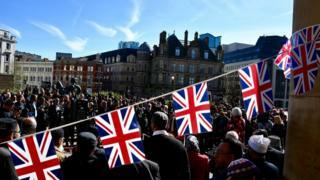 Hundreds of Muslims gathered in Birmingham to condemn the Westminster terror attack, which organisers vowed "will not define us". Families, students and mosque leaders joined the #notinmyname demonstration, in the city centre. Former government diversity advisor Dr Waqar Azmi, told them: "For far too long now we have had terrorists from all countries trying to define us. "We refuse to allow them to represent us. This is not in our name." Khalid Masood killed four people and injured 50 when he drove a car into pedestrians on Westminster bridge before stabbing PC Keith Palmer on Wednesday. The 52-year-old, who was born in Kent, had most recently been living in Birmingham and, with seven people from the city arrested in the wake of the killings, much has been made of the area's links to terrorism. But, former councillor Salma Yaqoob, who helped organise the demonstration, told the crowds the city did not deserve such a reputation. She spoke of the fatal stabbing of MP Jo Cox by Thomas Mair, in Birstall, West Yorkshire. "Stop bashing Birmingham, and stop bashing Muslims," she added, to a huge round of applause. It was organised by the Muslim community, but the rally attracted people from a range of faiths. Recalling the events outside Westminster on Wednesday, Mona Elshazly said she had wondered how to tell her daughters, aged five and six, what had happened. "We talk about things as a family. I picked them up from school, and I told them that a police officer had been stabbed trying to save people. "They were sad. They like the police. They visit them in school." It was enough for her youngest daughter to pen PC Palmer a letter, which Ms Elshazly, 37, carried on her placard in Victoria Square alongside her eldest's tribute to Aysha Frade, who died after being hit by the car Masood drove. "We are here to show solidarity," said the mother of two. "It doesn't matter about religion - we are all human. "We must come together as a community, we are stronger. These crimes are like a disease and together, we are the immune system." Yasser Siddique, 32, of Alum Rock, said: "What has happened, it is not from the teachings of Islam. These people are brainwashed. "It does worry me that Birmingham is getting a bad reputation. But I think we can do more as a community and speak to faith leaders and the police. "The faith leaders need to do all they can to educate and show the true message of Islam." The event took place after more than 200 mosque and community leaders in the West Midlands signed an open letter condemning the attacks. It reads: "We in the Muslim community were shocked and saddened by the hatred we saw in the attack at the heart of our democracy. "As a community we stand united in condemnation of those who sought to bring fear and division to the UK through this terrorist act. "Now more than ever, it is crucial for community and faith leaders from across this diverse city to stand united against hatred and division."